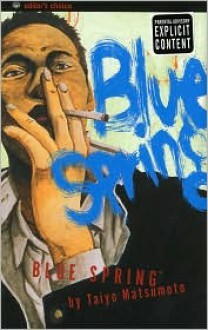 From the author of the masterful TekkonKinkreet, Taiyo Matsumoto's Blue Spring is a short story collection focusing on the lives of a small group of disenchanted high school students. Although spring usually connotes the blossoming of new life and a time of nurturing and anticipation, the spring for these characters is "blue." They can't wait for school to end and the summer to come. Their lives are balanced on the edge of a knife as they flirt with crime and their own deaths in the form of a deadly rooftop game. Each character has a different story to tell and the rebellion, questioning and frustration of these youths are palpable.